NOTE: To place order using Credit Card, P-Card, or Purchase Order – please choose kit size above and click “Add to cart” button. You can place order online without creating an account. Reagent exhibits at least 78% transfection efficiency of siRNA delivery. Transfection efficiency was determined by qRT-PCR. Fibroblasts are the most common connective tissue cells present in the body that are responsible for making up the structural framework. Embryonic stem cells are commonly employed for cell and molecular biology research and are imperative for the proper growth of stem cells. The Detroit-551 cell line was initially established in 1965 using skin tissue taken from the relatively healthy fetus of a Caucasian female. These cells exhibit a fibroblast morphology and cell type and are frequently used as feeder cells for human embryonic stem cell research. Also, this cell line is an adequate host for studies related to mammalian embryonic tissue. Due to their ability to have their growth enhanced by the presence of TNF (tumor necrosis factor) alpha, Detroit-551 cells are widely used in biomedical research applications. This cell line can be transformed by SV40, and have a lifespan of ~25 passages. Detroit-551 cells serve as controls in the study of mutated cells as they are normal, but they can also be quickly transformed by viruses. 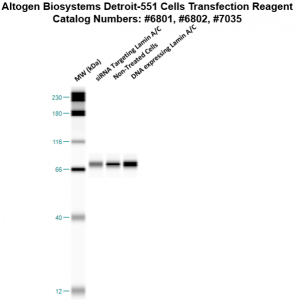 Altogen Biosystems provides polymer-based biodegradable transfection reagent kits for the Detroit-551 fibroblast cell line. The transfection reagent has exhibited high efficiency and high sensitivity. Figure 1. siRNAs targeting Lamin A/C mRNA or non-silencing control siRNA were transfected into Detroit-551 cells following the recommended protocol. At 48 hours post-transfection the cells were analyzed by qRT-PCR for Lamin A/C gene expression levels. 18S rRNA levels were used to normalize the Lamin A/C data. Values are normalized to untreated sample. Data are means ± SD (n=4). Figure 2. Protein expression of Lamin A/C in Detroit-551 cells. DNA plasmid expressing Lamin A/C or siRNA targeting Lamin A/C were transfected into Detroit-551 cells following Altogen Biosystems transfection protocol. At 72 hours post-transfection the cells were analyzed by Western Blot for protein expression levels (normalized by total protein, 10 µg of total protein loaded per each well). Untreated cells used as a negative control. Altogen Biosystems provides pre-optimized transfection kits and electroporation products for life science research. Transfection products are developed for individual cancer cell line and transfection protocols are optimized to enable high transfection efficiency of biomolecules. Altogen Biosystems developed in vivo delivery products for small animal research, mouse and rat targeted tissue delivery: liver targeted, pancreas targeted, kidney targeted, PEG-Liposome-, Nanoparticle-, Lipid-, and Polymer-based in vivo transfection kits. Advanced formulation of reagents and optimized transfection protocols provide efficient intracellular delivery of biomolecules. Read more about transfection technology at Altogen’s Transfection Resource. Altogen Labs provides GLP-compliant contract research studies for pre-clinical research, IND applications, and drug development. Biology CRO services include: Xenograft models (30+), development of stable cell lines, ELISA assay development, cell-based and tissue targeted RNAi studies, safety pharm/tox assays, and other studies (visit AltogenLabs.com).